Celes Chère is one of my personal favorites of this game, and mostly because she has possibly the most emotional journey through the story. Celes is basically a creation of the Empire and is genetically modified with Magicite to give her the possibility of using magic (something that is, obviously very rare in this world). During the beginning of the game she is feared as an infamous general of the Empire. She begins to dislike the Empire’s morals and conquest, and some stuff goes down leading to Locke saving her from being killed by the Empire. This begins the connection between Locke and Celes, and they begin to fall for each other. The other members of the group aren’t always very trusting of her however, and she is welcomed very cautiously. At a very crucial part of the story the group goes into the Magitek Factory of the Empire. While there party sees all of the terrible things that the Empire is doing to the Espers, and once they reach their destination in the Factory Kefka ruins the day. Kefka convinces the group that Celes tricked them into coming to the Factory and that she was still working for the Empire. As the group is kicked to the side Celes manages to bring Kefka and herself out of the picture, however it is not seen as an act to save them by the group and their already cautious trust for her is broken. Celes is later seen back as the General that she once was, but Locke, being the closest to Celes didn’t believe she would betray them and tries to talk to her to figure out only to be unanswered by Celes. The group’s trust for Celes doesn’t return until the she takes the sword Kefka gave to her to kill the group and stabs Kefka with it. This however does not stop Kefka from kicking Gestahl off the floating continent and showing his true colors as the real villain, destroying the entire known world in the process. The end of the game begins a year after these events as Celes wakes up from a coma. Cid, the man who infused Celes with Magicite, took care of of Celes for the year she was in her coma on this small island. Cid is very sick at this point and as Celes gets better the player can decide to save him or to let him die (he is perceived as an evil man, because he was the main Empire scientist to do all the evil things to the Espers). If he does die, Celes, in one of the most beautifully sad, and powerful moments in video games that I have experienced, attempts suicide in her loneliness by jumping off a cliff. This however does not kill her, and on the ground where she landed she sees a wounded bird wrapped by a Locke-look-a-like-bandana of its wound and she takes it as a sign that Locke is still alive, giving her the motivation to move forward. 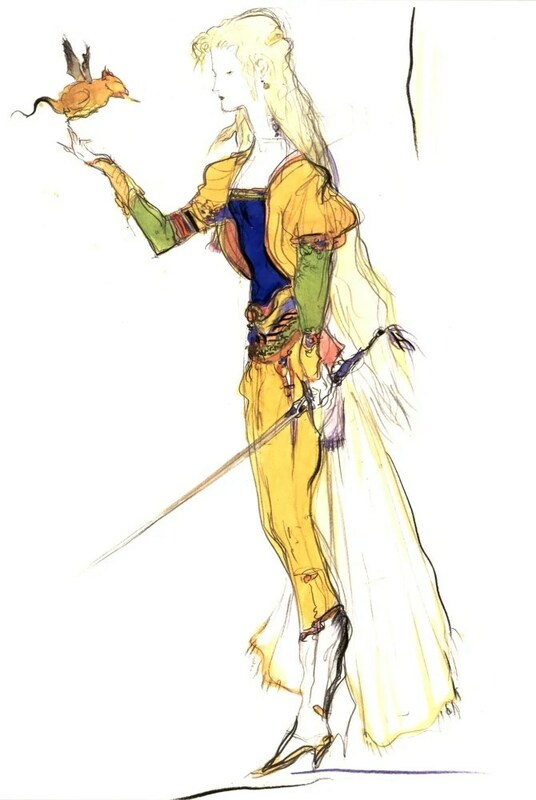 During this portion of the game she becomes the main leader in bringing the group back together and go to defeat Kefka. Celes is shown to be obviously beautiful and even graceful and delicate. Specifically in the Amano artwork I love how she is expressed. Her pose shows her beauty and grace while the fierceness of her eyes show her power and determination as the ex-general of the Empire. Celes’s Theme pretty much follows the very common pattern used for the character theme’s of two main sections. However the A (first) section is rather short and is not repeated as the B section is. The A section is also quite significantly different than the B in that it a very fast and unresting feel to it. It directly leads into the very slow, heavily emotional mood of the B section. The A section seems to display the fighting, general, and Empire side of Celes as it shows her extreme conflict of self as she tries to fit in with the others and love Locke. This of course leads to the B section which really displays her sense of loneliness she has, and really fits with her moment of attempting suicide. However, both with the instrumentation of the melody, and harmony to it, it also has a slight feeling of happiness and attachment. Celes’s theme beautifully fits her character and story in the game in these ways, and is one of my favorite character theme’s.